Private transport to and from golf courses in the Algarve. The best way to get from your holiday accommodation to any Algarve golf course. Flexible golf transfers from one course to another and between your hotel. Transportation for small or large groups of players in quality vehicles at affordable prices. Private transfer service available all year with no pick-up time restrictions and always adjusted to your tee-times. 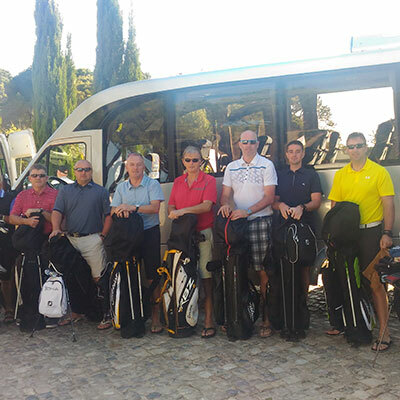 Almost two decades of Algarve golf transfers under its belt places Algarserra has one of the oldest and most experienced private taxi transfer companies operating in southern Portugal. Our solid reputation is supported by lots of positive reviews from both individuals and travel agents. Algarserra is known for its punctuality, service flexibility and attention to customer satisfaction. 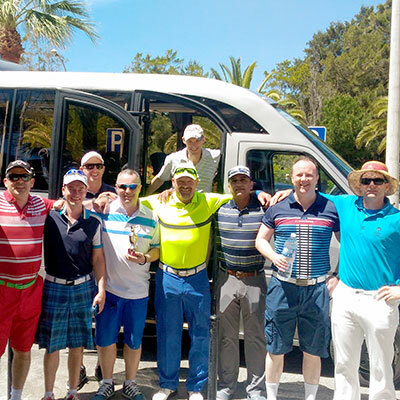 Algarserra transports passengers between all the Algarve golf holiday destinations under the approval of the portuguese board of tourism and strictly applies all the insurance and safety legislation requirements. Aimed at visitors who seek a reputable private transportation service with guarantee of quality. You can rely on us for all your ground transportation needs in the Algarve. Dealing with just one company will save you time and money. We are fully certified and insured to provide private golf transfers, transfers from and to Faro airport, transport to Algarve theme parks and other tailor-made taxi services you may require. If you’re looking for comfortable and modern vehicles, professional staff and an on time service then Algarserra is the right company for you. We want you to have a great experience. Algarserra golf transfer service is supported by its own fleet and drivers. 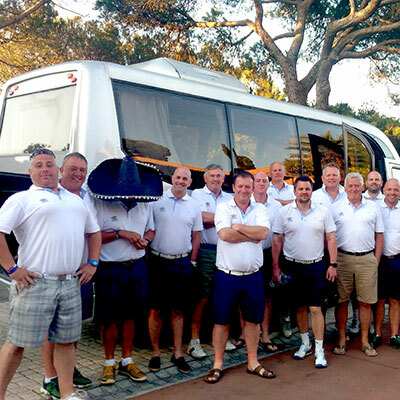 We operate a modern, diversified range of vehicles such as executive estate cars, MPVs, vans and mini-buses suitable for small or large groups of golfers. We operate Mercedes & Ford vehicles and will provide the most adequate transport to transfer any amount of players and accommodate all their golf bags. We take our fleet maintenance seriously and comply with all the insurance and safety legislation required by the portuguese authorities. All the vehicles have air conditioning and we keep them clean and presentable at all time. They are driven by polite and experienced english speaking chauffeurs with extensive knowledge of the area. Discover all the golf courses throughout eastern, central and western Algarve. We have pin pointed them below so you can better understand the geography and distances between golf courses, holiday destinations and Faro Airport. We cover them all. Planning your golf trip to the Algarve? Below you can find transfer prices between all the major holiday locations and Algarve golf courses. Change the origin of your transfer (1) to show the prices from that location (2) and see how to book (3). From / where are you staying? We will reply shortly after with the final price, necessary details and instructions to confirm your transfer service.